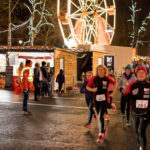 Kilkenny Recreation & Sports Partnership and Yulefest, invite everybody in Kilkenny to lace up their running shoes and get out to run Ireland’s Medieval Mile Run. On Friday, December 7th at 7.30pm, runners, joggers, walkers, hand cyclists, of all ages will come out on the streets and run Ireland’s Medieval Mile Run. It will take place on closed streets under the Kilkenny’s magical Christmas lights. The route will take runners down the Castle Road, through The Parade Plaza, High Street, Parliament Street to the finish at Irishtown. a Recreational Mile (run, walk, jog). Please note: Participants MUST register for both events online. Children taking part must always be accompanied by an adult. You will receive your number on the night and only those with numbers will be allowed take part. All participants must sign in at event headquarters on the night from 5.30pm. No entries will be available on the night.